Year two is a time of great curiosity when 5- and 6-year-olds begin questioning everything about the world around them. Our year two earth science worksheets are intended to answer many of those questions with exercises that teach about constellations, water cycles, how clouds are formed, and even the layers of the sun and various planets. With colorful illustrations and easy-to-grasp instructions, these worksheets are sure to ignite an early love of science. Ever wonder what the earth is made of? practise reading and writing, and learn about the four layers of planet Earth. Find out what wind is all about in this intro to earth science worksheet. Learn all about precipitation and the role it plays on the planet in this weather science worksheet. Share a star-gazing session with your little astronomer! 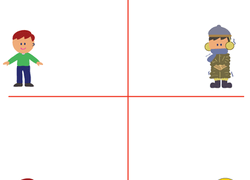 This constellation chart is full of fun stories about the different groups of stars. Little outdoor explorers can get to know the national parks with this map. Can you find the national parks in your state? Brrr, it's cold outside! 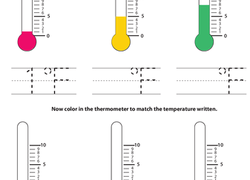 In this worksheet, kids practise reading thermometers to figure out what the temperature is. Did you know snowflakes are so unique, there are no two alike? 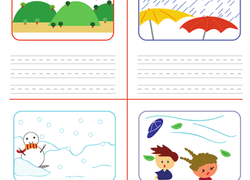 Teach your child about how snow forms with this worksheet. Help your kid get his head around the seasons with this worksheet that asks him to draw a picture of the correct season according to what each kid is wearing.